Pity the poor pumpkin. It gets dragged out and plopped into everything the instant the calendar page flips over from August to September, and it suffers a nonstop barrage of unlikely pairings pretty much straight through until December. Pumpkin spice latte! Pumpkin lager! Pumpkin breakfast cereal! Pumpkin yogurt and jello and risotto and air freshener and pet shampoo! ENOUGH. And then, poor pumpkin, it gets placed back on the shelf for the better part of a year and everyone forgets about it, unless it's to say something like, Ohhhhh no, not pumpkin, I am SO SICK OF FREAKING PUMPKIN. Hashtag BASIC. Not me. I am a year round, card-carrying Friend of Pumpkin (currently organizing local chapters in a town near you). All my hummuses (besides being a hilarious dip-themed idea for a soap opera) are pretty nontraditional stuff. In the past, I've made roasted beet hummus, rosemary white bean hummus, black bean hummus, carrot hummus, spiced sweet potato hummus, and this particular recipe for edamame hummus on countless occasions. Considering the word hummus itself stems from the Arabic word meaning "chickpeas," I'm not really sure any of these ought to actually be called hummus? All the same, this edamame version (with its lemon, garlic, olive oil and a hefty dose of tahini) actually comes closest to a traditional recipe, so I'm doubling down on its hummus status. The most important thing you need to know about it is that it's delicious smeared on toasted black sesame & scallion flatbread, carrot sticks and radish slices, and it's so seductively fragrant you'll most likely start eating it out of the food processor while it's still warm. I rarely see a bowl survive to the "fully cooled & in need of storage" stage--especially now that I have a voracious baby who has claimed this as one of his favorite foods--which makes it one of my proudest accomplishments. Pair this with enough fresh veggies & bread and it's a meal in itself! Is "dip for dinner" a thing, or did we just invent that right this very second? YES, YES WE DID. I have a hard time running straight ahead at a goal--any goal. I'd be a terrible running back (a football reference! Let's do this!). Sure, I can see down the path to where I'm supposed to be heading, but along the way I always seem to glimpse a shiny distraction I can't resist. I could change my major to architecture (true fact, I changed it five times); I knooow I'm growing my hair out, but I could chop it in a pixie like hers; I could go to grad school for creative writing; I know this is supposed to be pizza, but what if it was also kind of lamb vindaloo? I've never been able to resist a twist. With that knowledge in mind, and the realization that I'll probably never be a great team sports player in my heart (it's okay guys, I've made my peace with it), these crazy, trashed-up nachos should come as no surprise. If ever there was a perfect blank culinary canvas to experiment on, it's got to be nachos. Invented in a Mexican border town for Americans by a Mexican maître d' in a hurry, they are about as far from authentic anything as it's possible to be. Broiled, melty grated cheese or luscious cheese sauce poured on top? Make them with crisp, restaurant-style chips or grocery store scoops? Toppings, toppings, and more toppings? Yes, yes, yes! It's all good, my friends. Nachos are endlessly forgiving. When it comes to watching The Big Game, I've always unapologetically been in it for the snacks (and the commercials). IT IS KNOWN. For me, the Super Bowl is a time to flex a little culinary muscle and try out bold new snack ideas on a captive audience desperate for cheesy, spicy, crunchy goodies. Something happened while I was dreaming of nachos this time, though. I was distracted from my straight-ahead path by a bottle of gochujang chili paste, with visions of Korean-Mexican fusion (a combination that at this point has become a classic) doing end-zone dances in my head. Behold, the delicious twist of my dreams! 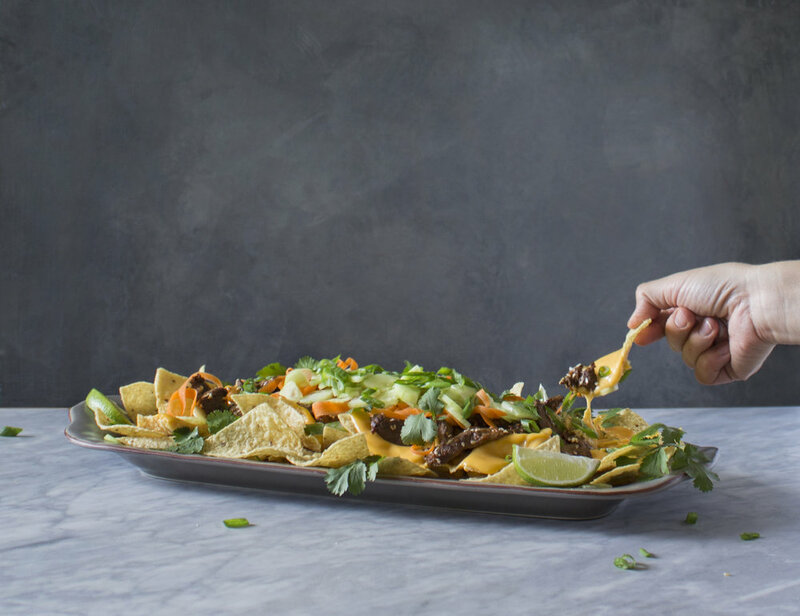 Spicy, sweet bulgogi-style beef sits atop a layer of crunchy chips and a warm blanket of molten queso, with a sprinkling of freshly quick-pickled vegetables on top for extra crunch, color and zest. With a little prep work, this can be made and served the same day, which means there's plenty of time to get this crazy fusion fantasy into your Super Bowl spread! Thinly slice steak and place in an airtight bag or container with soy sauce, scallions, ginger, brown sugar, gochujang, sesame oil and garlic. Toss until thoroughly combined and coated, refrigerate for three hours. Place carrots and cucumbers in separate small bowls, add one tablespoon of lime juice to each, toss to coat then cover and refrigerate. To make cheese sauce, melt butter over medium heat in a small saucepan, sprinkle with flour. Cook, stirring frequently with a whisk, until the mixture has turned a light tan in color. Immediately whisk in milk and continue to stir often. When the sauce becomes thick enough to coat the back of a spoon (think gravy), whisk in grated cheese a little at a time and stir until completely melted and smooth. Remove from heat, whisk in gochujang. Heat vegetable oil in a skillet over medium high heat, add marinated steak to pan in two batches, stir frying quickly just until done. Sprinkle with sesame seeds and set aside to cool slightly. 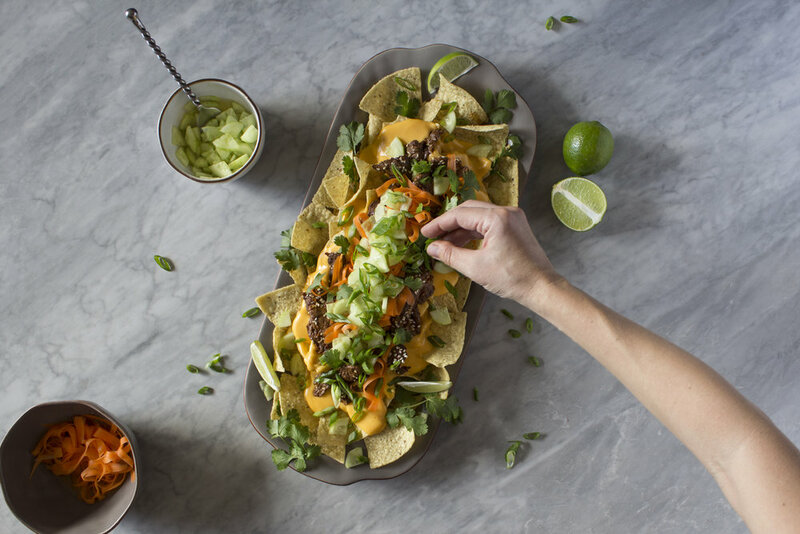 To assemble nachos, spread out tortilla chips on a platter, then ladle on that cheesy, spicy goodness (reheat cheesesauce to a pourable consistency while whisking, if necessary). Spread out steak slices evenly on top of this. Remove quick-pickled carrots and cucumbers from fridge, pour off any excess liquid, then arrange on top of nachos. Finally, sprinkle with scallions and fresh cilantro. Serve and enjoy! In the fall of 2012, which now feels like a lifetime ago, I uprooted myself and moved to New York City. Newly divorced and raw as a peeled cuticle, I was a ridiculous mismatch for the city from the start. My suburban sensibility and thirtysomething weariness set me apart, I suppose, from every other dewy-faced twentysomething around me who had just arrived for what they assumed would be the "New York chapter" in their young lives. I had waited too long, New York and I were never destined to fall in love. That turned out not to matter at all, though, because I was already falling in love in a very real sense. In the company of the man who would eventually become my best friend and husband, I explored as many as I could of the thousands of truly fantastic opportunities for eating in the city. One of the places Tim and I identified early on was a trendy but humble little joint right in our Queens neighborhood of Sunnyside, perched right on Queens Boulevard off the 7 train. Underlit and unadorned, Salt & Fat greeted you with casually untucked waitstaff and bacon fat popcorn served from a brown paper bag---it was that kind of place. We loved it. The menu was unapologetically fusion, but without pretense--kimchi and daikon served matter-of-factly alongside American comfort classics like BLTs and marshmallow fluff. Just like me in my clearance-rack jeans and unfashionable backpack juxtaposed against the glitter and grace of the city, there were a lot of combinations on that menu that seemed downright out of place at first glance. A few bites in, you suddenly realized that the union of ingredients (no matter how unexpected, like duck breast and lychee) was just the perfect thing, all you never knew you wanted...at least for the moment. It was this heady, crazy feeling of "things you never knew belonged together" that I was thinking of when I put together this dish, a rich combo of spicy and sweet, salt and fat. 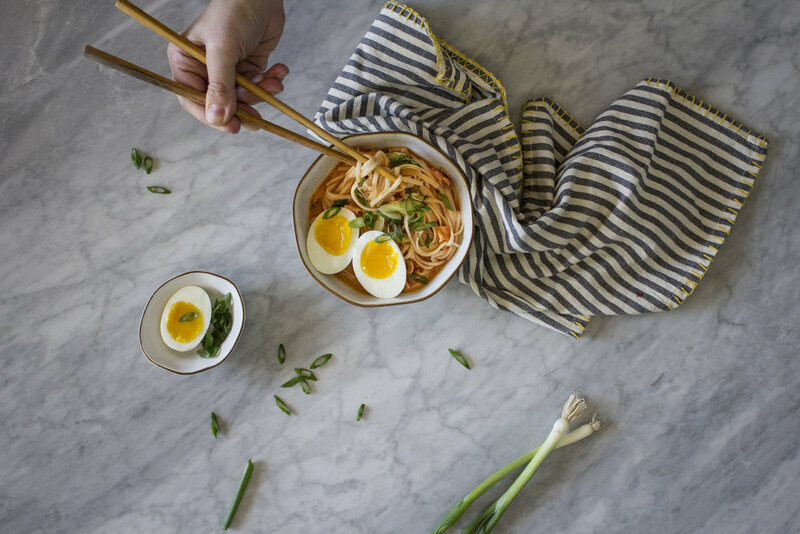 Korean chili paste and chewy udon meet classic American bacon and eggs (I almost always use Bon Appetit's method for perfectly jammy-yolked soft boiled eggs) in a noodle dish slicked with just enough soup to keep things interesting. It's weird, it's comforting, and it reminds me of feeling utterly lost and yet totally found at the same time. In a crushing but not-at-all-shocking twist (restaurants pop up and wither on the vine in New York, and elsewhere, almost constantly), I recently searched for Salt & Fat's website only to find that they had closed up shop last year. R.I.P. to a place that nurtured the beginning of my relationship and wrapped it in a warm blanket of pork buns, oxtail terrine and yuzu panna cotta (just sounds weird when I put it that way, but hey)...my "bacon & eggs" udon bowl will forever stand as a tribute to your memory! Fill a mixing bowl halfway with ice water. Bring a large pot of water to a boil, carefully lower eggs one at time into water using a slotted spoon (cold out of the fridge is fine, just take it slow). Adjust heat to maintain a gentle boil once eggs are in, cook for exactly six and a half minutes. Remove eggs quickly and place in ice bath, chill for a few minutes until just warm to the touch. 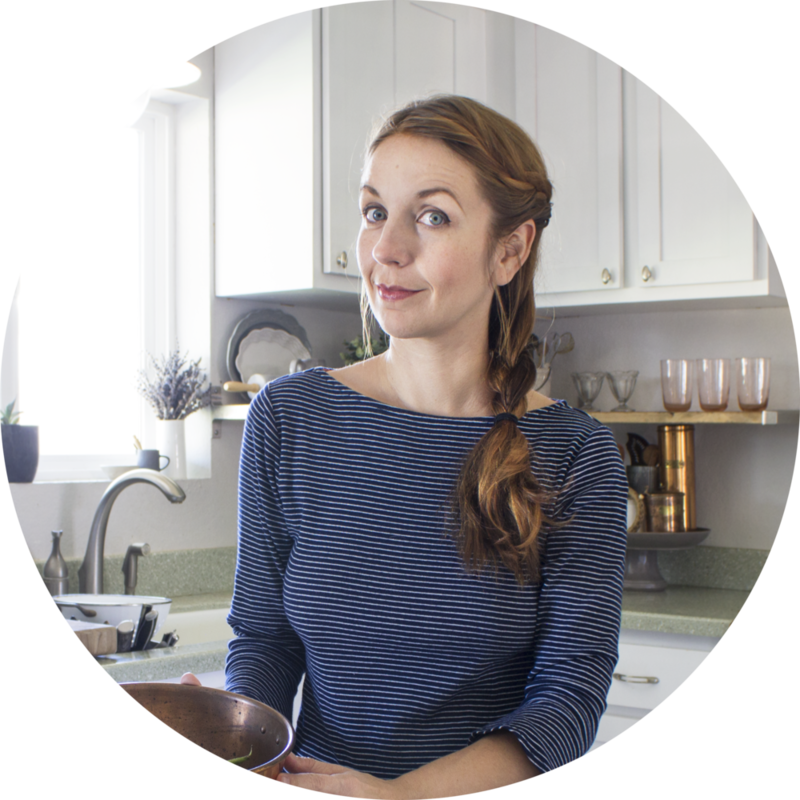 Gently crack shells and peel eggs, set aside. Heat a large skillet over medium high, saute the bacon until fully cooked (best when it's just short of crispy, still a little chewy), drain all but about two tablespoons of fat and place in a bowl. Add gochujang and honey, whisk with a fork until combined. In a medium size pot, bring stock to a simmer over medium heat, add bacon mixture. Add udon noodles and simmer until chewy, remove from heat. Taste broth at this point and add salt if necessary, or more gochujang or honey if preferred. 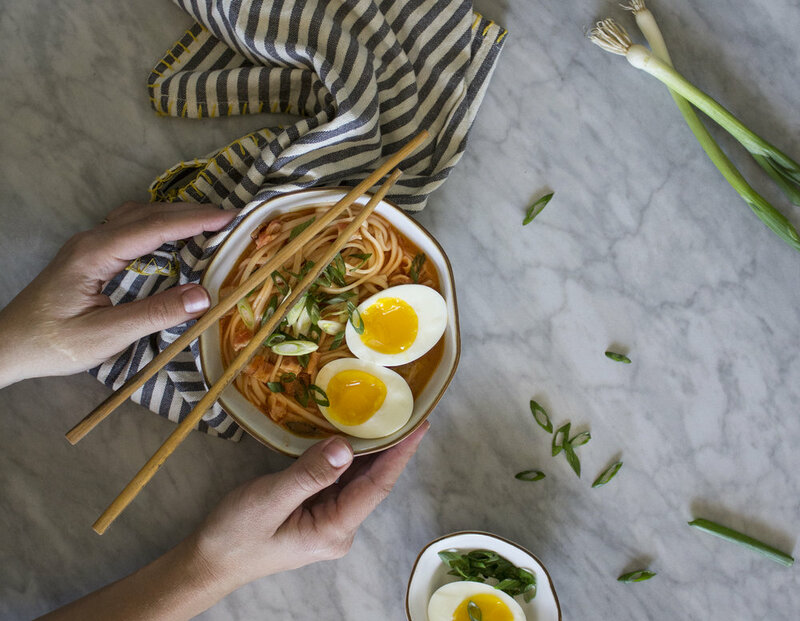 To serve, scoop noodles into bowls, top with soup, then garnish with scallions. Carefully slice eggs in half and nestle into the noodles with perfectly jammy yolks pointing up. Slurp and enjoy!